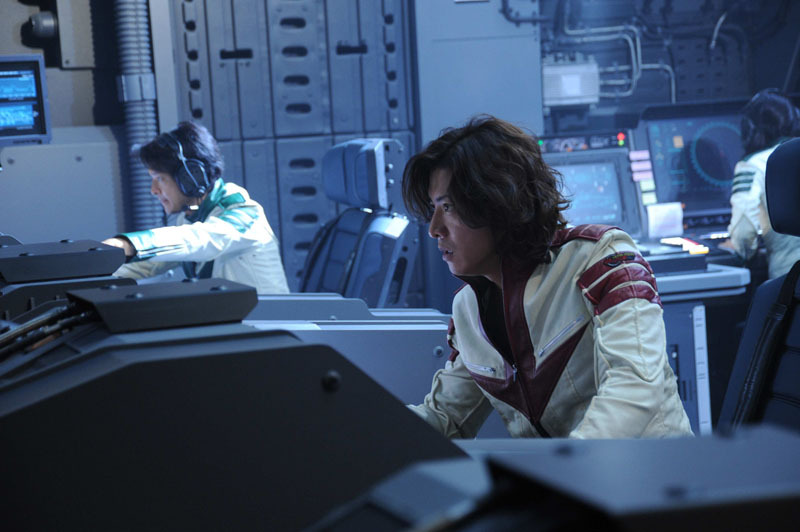 I was only ever a casual fan of Star Blazers, the US-edit of the Space Battleship Yamato anime, but that didn’t stop me from being pretty excited to see this live-action adaptation after checking out the trailer. The promise of some high-intensity space battles and the titular flagship firing its massive Wave Motion Gun hit all my sci-fi buttons. Four years after its Japanese theatrical release, the flick finally hit Stateside with a Blu-Ray/DVD combo release courtesy of Funimation. The film wastes no time letting you know its strong point, as we jump right in with a large-scale ship-to-ship battle. Smaller fighters weave deftly in and out of laser and rocket fire while the battleships heave broadside blasts at the enemy. It’s a riot of color and speed, managing to be fun and exhilarating despite the grim outcome of this initial conflict. Of all the elements updated from the source material, it feels like this is where things really shine. Gone are the choppy and muddy cel-animated sequences, replaced with brilliant digital replicas that retain enough of the charm of the original ship designs to be familiar and to trigger the required nostalgia. It’s fluid and gorgeous. It’s clear that the film isn’t operating with a huge budget, but by wholeheartedly embracing digital animation and live-action composites for the ship combat scenes they really make it work. It’s a little less effective in the cramped confines of the underground bunkers. The grimness and lack of color here often cause the characters to “pop” over the scene. This problem is even more apparent when the characters are aboard the Yamato. I love that they incorporated the original uniform design into a leather flight jacket, but the colors retain a very anime vibrancy to them. Among the gray hallways and bleak minimalism of the battleship interior everyone ends up looking a bit cartoonish. And this is where the script doesn’t seem to help matters much. When compressing a long-running series into just over two hours of film, you’re going to miss a few elements here and there. And unfortunately Space Battleship Yamato seems to rely almost entirely on a strong familiarity with the source material to fill in the gaps. The characters are played incredibly broad and being based on a 70’s space opera anime most weren’t exactly striving for profundity to begin with. So the goofy optimistic guy is EXTRA goofy and optimistic. The pouty badass chick is SO POUTY AND BADASS THAT IT HURTS. And the hero of our story is played so unflinchingly cool and unburdened by worry that when he actually ends up saddled with some responsibility and isn’t quite sure how to deal with it you’re left in a full-fledged panic. Fans of the original anime will likely be okay with this, they know the backstory well enough to flesh the characters out, to understand their dialogue as something more than flat exposition. The rest of us can just pass these scenes off as necessary interludes to battle. We learn enough about the characters to care, at least a little bit, as they charge into the fray to meet their various fates. And if their stories haven’t hooked you, the action certainly will. 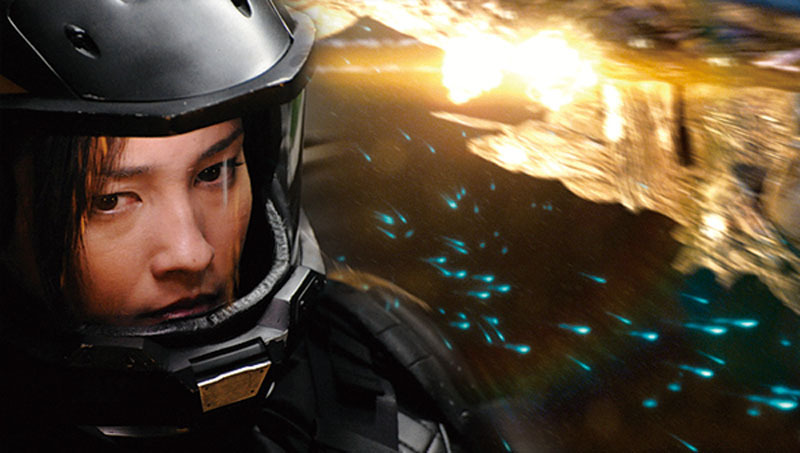 The film’s centerpiece action scene is a space combat sequence that morphs into a planetary landing and then a troop-level assault. It’s big, flashy, bold and thrilling. I give the film a lot of credit for not holding back in bringing this to the screen. Any other sci-fi flick operating on this kind of budget would have played it much safer and the end result probably wouldn’t have been as much fun. As it is, Yamato delivers on that count in spades. 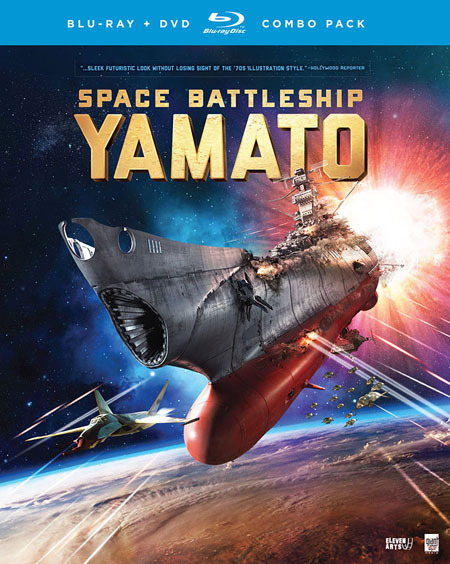 Space Battleship Yamato Pre-Visualization – 25 minutes – The special features for this release are kind of weird. They feature very little context and scant dialogue. This one is essentially 25 minutes of pre-vis and comparison to the final product. The pre-visualizations are a touch less crude than what I’ve typically seen, and do lay a good foundation for the end product but still come across as just a watered-down version of the film you’ve just watched. While this kind of thing may hold interest for burgeoning CGI animators or FX junkies, without any explanation or voice over there was little here that felt compelling. VFX Making Of – 12 minutes – Similarly free of any context or explanation as the pre-vis, this feature shows the layering of digital effects over original shots. This covers most of the larger VFX set pieces. Local Yamato – 1.25 minutes – My favorite of the features, this brief bit shows various locales/monuments throughout Japan with the giant digitized Yamato flying over them. I’m not sure if this was done to give a sense of scale, or to just regionally pump people up, but it’s kind of bonkers and I kind of love it. I really wish they would have thrown in one of the Yamato cruising by the Statue of Liberty or Mt. Rushmore. News Flashes – 1.25 minutes – TV Promo spots hyping the release of the flim. Premiere Announcement – .75 minutes – More of the same.